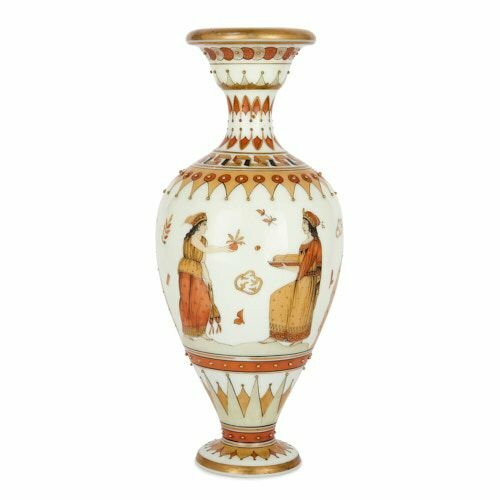 This beautiful opaque vase has been attributed to the famous Woodall workshop, working within the prestigious company of English Thomas Webb & Sons. The Woodall workshop was figure-headed by Thomas and George Woodall, two glass craftsmen based in Stourbridge, England in the late 19th and early 20th Century. 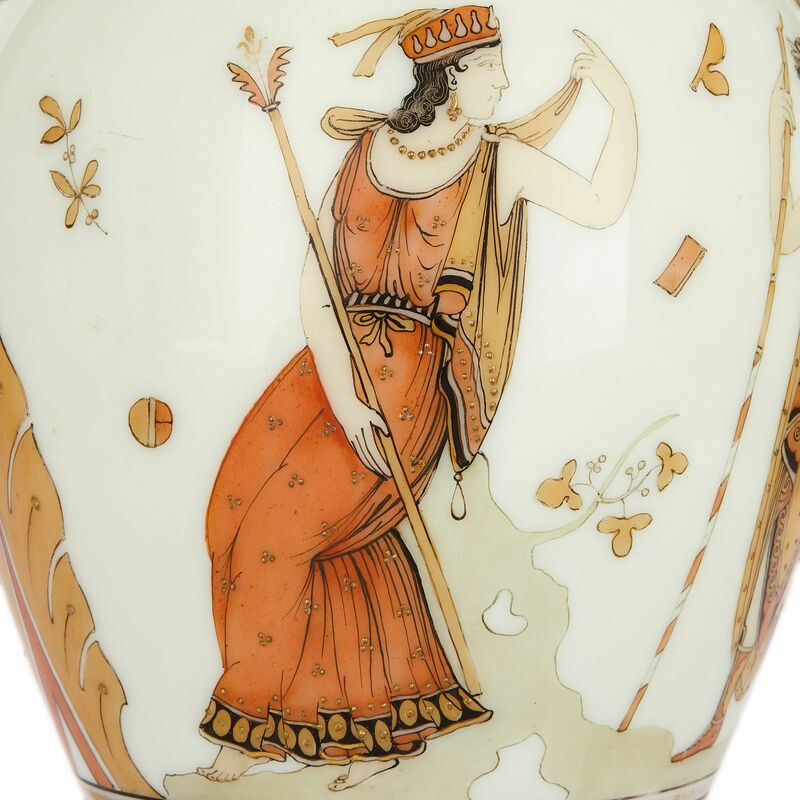 The Woodall team were famous for their cameo work — that is, etched and carved glass — and their coloured glass wares. Such items were very popular during the lifetimes of Thomas and George, and continue to be highly sought after today. 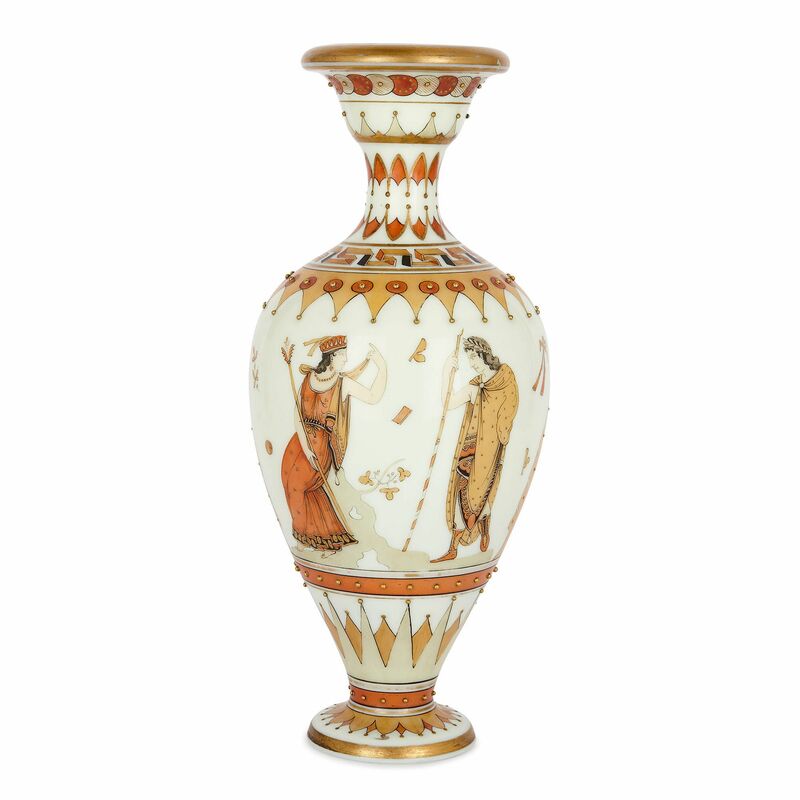 This vase has been beautifully parcel gilt and painted. 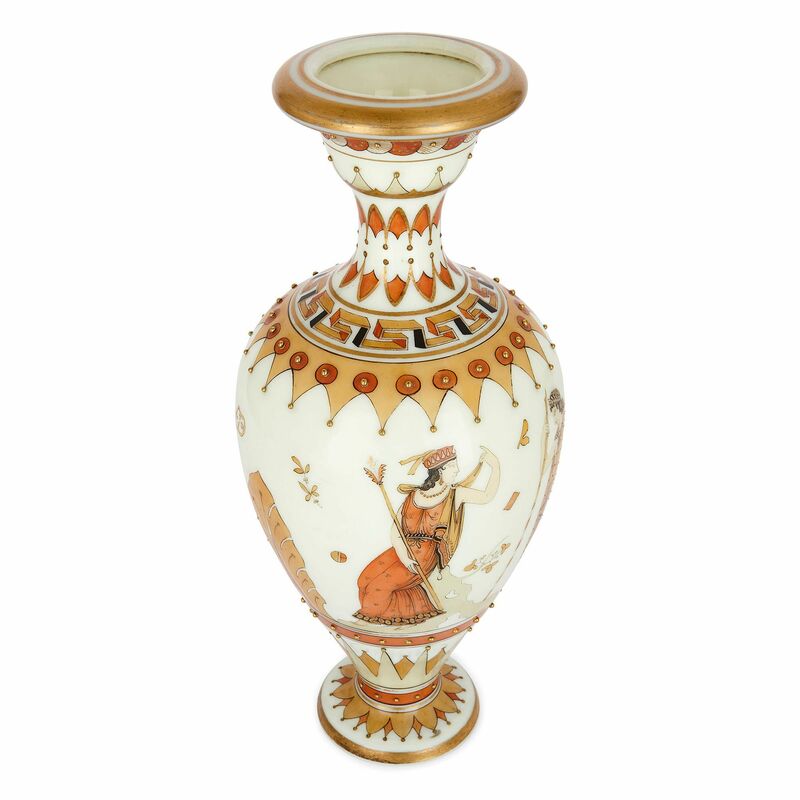 The vase stands on a circular base, which has a gilt band rim, with stylised orange and gold leaf-forms above. 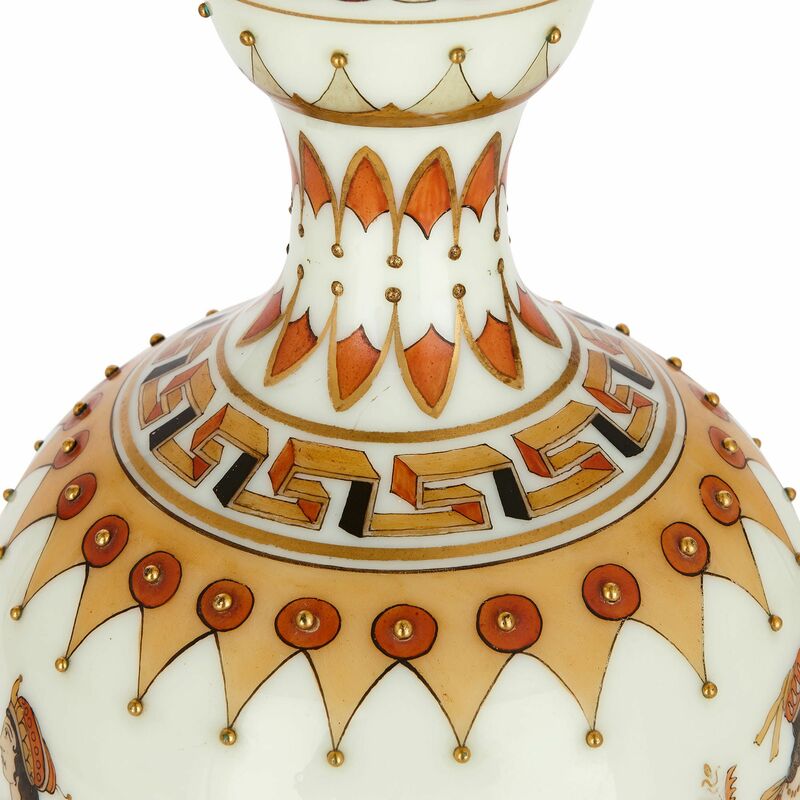 An orange band, decorated with gilt studs, marks the transition from the base to the body of the vase. Above, the lower body features repeated, pointed cream and gold forms, with gilt stud tips, topped by a second orange band, also with gilt studs. The main body of the vase has been painted with two pairs of figures, separated by stylised palm leaves. One group consists of two women who face one another, one carrying a dish full of food, possibly bread, while the other holds a vegetable in her outstretched hand. In the other group, a woman turns her head to look, over her shoulder, at a man who approaches her. She picks at her cloak and raises her finger in his direction. Both figures carry staffs; the woman's staff has a lotus-tipped end, similar to the kind carried by Hera, the Queen of the Olympian Gods. The spaces between the figures are dotted with depictions of leaves and flowers. 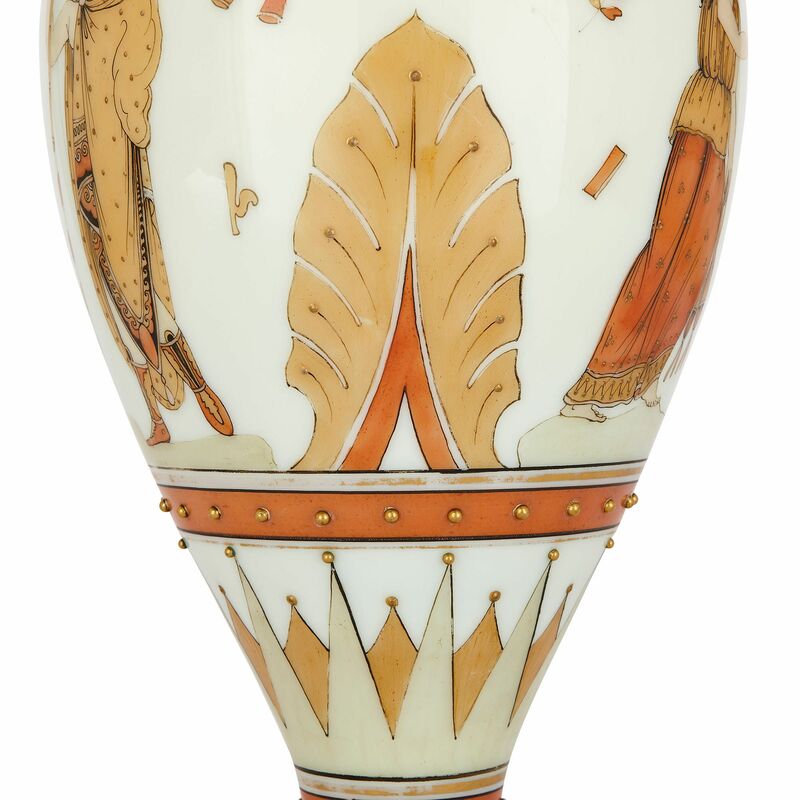 Above, the upper part of the vase body is fringed by gold, pointed patterns, with gilt-stud tips and orange medallions with gilt-stud centres. The neck is ornamented with gold, orange and cream geometric and circular patterns, including a three-dimensional Greek key pattern, again articulated by gilt studs. A gilt band encircles the vase mouth above.